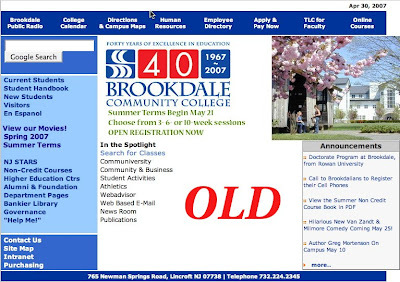 If you remember my March 31st posting The Evolution of the Web - I discussed the internet wayback machine, and used it to demonstrate that our college webpage had not been updated substantially since June 2002. Why is this important? - In 2007, the web is, for most - students, parents and the community-at-large - their first, if not only, point of contact with the institution. A strong web-presence that is informative, attractive, inviting, and easy to navigate is critical to remaining competitive in the increasing global and fractured educational landscape. 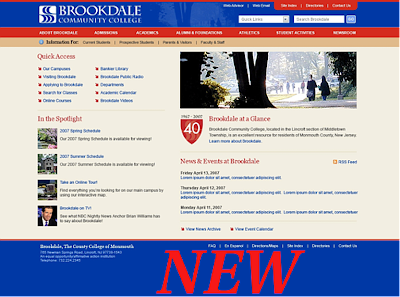 In response to criticism over poor navigation, and an overly cluttered appearance, the Brookdale college website is undergoing a long over-due re-design. Like most at the college, I haven't been given an opportunity to see the proposed new website - until now. In the spirit of sharing and openness I give you a side-by-side comparison of OLD versus NEW. Click on either image to see a larger, more detailed view of each site. Once you've given these a thorough review, there's a little poll at the bottom of this posting to capture user opinions of the sites. I've got my own opinion, but to avoid skewing the poll, I'll wait to share my thoughts in a later posting - I'll also let you know how much this redesign cost. From TED 2006, here is Hans Rosling, a professor of global health at Sweden’s Karolinska Institute. This presentation is interesting for a number of reasons. First is Rosling's dynamic and enthusiastic presentation style. You can tell when someone loves what they teach - it's infectious. Second is the focus of his work - global health and poverty trends and common misconceptions regarding differences between developing countries and the so-called western world. The third reason to enjoy this 20-minute presentation is how the data is presented. Rosling makes his case using statistics drawn from United Nations data and illustrated by visualization software he developed through his nonprofit Gapminder. I marvel at how this software takes flat data and brings it to life. It's a great example of how technology - at it's best - can help to elucidate rather than obfuscate. So whether you like to watch great presenters in action, are interested global issues, or just want to see new technologies for teaching and learning, give this video a watch - I think you'll be hooked! Gapminder and Google share an enthusiasm for technology that makes data easily accessible and understandable to the world. Gapminder’s Trendalyzer software unveils the beauty of statistics by converting boring numbers into enjoyable interactive animations. ... Google intends to improve and scale up Trendalyzer, and make it freely available to those who seek access to statistics. were ubiquitous on our respective college campuses - leading us to create our own podcast. 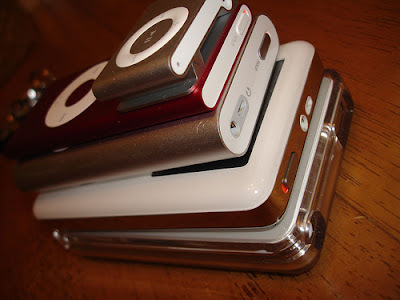 In a recent blog, Gordon details the announcement that Apple had sold their 100 millionth iPod - a staggering one iPod sold every 1.7 seconds since 2001 - 10 million in March 2007 alone. Likewise Apple's online music store iTunes has been wildly successful - according to Gordon's math - 19.8 tracks downloaded per second. Ridgewood, N.J. research firm Student Monitor conducts a biannual Lifestyle & Media Study, surveying a representative group of 600 students to determine what's "in" on college campuses. 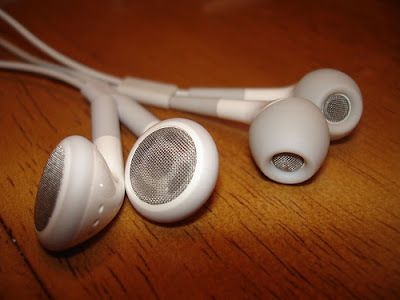 According to the most recent survey (Spring 2006), not only are iPods "in" - iPods are more popular than beer. iPods topped the list leaving perennial #1 "Drinking beer" at #2. The last time this happened to beer was in 1997. The culprit? Another disruptive technology you might have heard of - the Internet. Congratulations to friend and colleague Karl Kapp. He's had a good week! Karl, a scholar, writer and expert on the convergence of learning, technology and business operations, holds a Doctorate of Education in Instructional Design at the University of Pittsburgh. He is a full professor of Instructional Technology at Bloomsburg University in Bloomsburg, PA and Assistant Director of the University’s acclaimed Institute for Interactive Technologies (IIT). Visit his Web site at www.karlkapp.com or his blog at http://karlkapp.blogspot.com. First came the announcement that Karl has been selected as one of 2007's Top 20 Most Influential Training Professionals by TrainingIndustry, Inc. It's a pretty diverse group in the Top 20 - it's great to see Karl get this recognition as one of our thought leaders in teaching and learning. One of the areas Karl has been very active in is advocating for gaming in learning, which leads to a second reason for Karl to smile this week - the release of his new book. 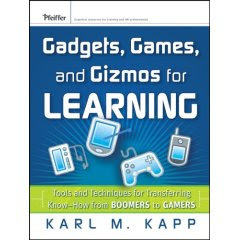 The just released, Gadgets, Games and Gizmos for Learning: Tools for Transferring Know-How from the Boomers to the Gamers describes the learning methods necessary to transfer knowledge from the boomer generation to the upcoming gamers using tools such as gadgets, games and gizmos. The book’s web site is www.gadgetsgamesandgizmos.com. The premise of the book is that there is a huge population of baby boomers in the workforce with a lifetime's worth of knowledge and expertise. These boomers are getting ready to retire and take with them their knowledge and expertise. Unfortunately, we are faced with an incoming workforce - the gamers - who learn in ways that are dramatically different from any generation before them and the tools we have transferring knowledge are woefully inadequate. Additionally, the book provides a number of simple and effective strategies for incorporating these new tools (gadgets, games and gizmos) into the classroom. The material is presented within a framework of sound pedagogy and well-established instructional design practices. I think Karl has really hit upon something here and that this book will become an essential resource for classroom instructors, as we move further into the 21st century. I thought Google was free. Not quite Haiku - maybe more like Dr. Seuss - but not bad for an engineer! 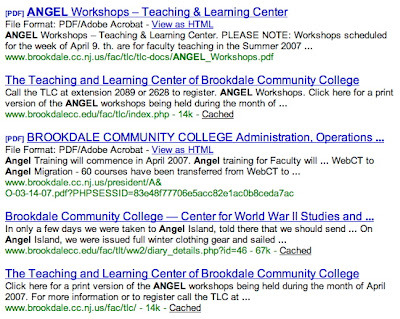 For comparison - here is a screenshot of the search box on the college webpage - sorry couldn't embed this one. So you might be thinking - big deal, so it took them a little longer to get the code into the page; they've got it there now, so end of story. 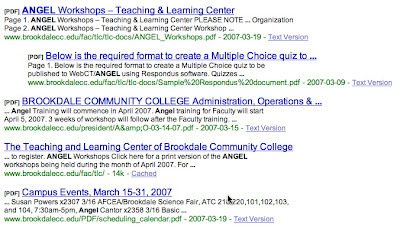 Nothing you haven't seen before here - about 70 hits; with 37 results shown (Google search omits similar or identical results). But wait, there is something new - I recognize it, maybe you don't - it takes a trained eye or someone who teaches technology. Just above the search button is the word appliance - here's a closer look. These are the two appliances Google sells - you install these in a rack with your switches and routers. The low-end appliance (blue) starts at about $3000-$6000 and requires a yearly maintenance fee of about $1000. So who buys these? Enterprises - large businesses - that need to search 100s of thousands of documents. Here are the top five hits for the two search engines - compared side-by-side. The results aren't exactly the same, but similar enoguh that we can call it a draw. Now to compare these approaches, we need some sort of metric - I'll define one here I call the Q-Factor - we take the quality of the results (about equal here) and divide by the cost. Here's a 5-minute video with a slightly more technical explanation of mash-ups.